PRESS RELEASE: Project wins Heritage Lottery Fund support! The Yorkshire Icon Ltd charity has received initial support* from the Heritage Lottery Fund (HLF) for the ’Yorkshire Man of Steel’, it was announced today. 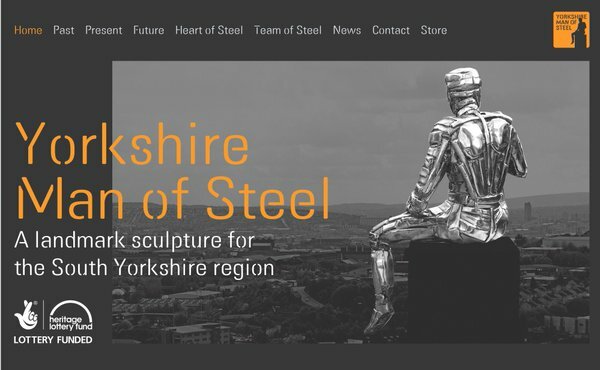 The Yorkshire Man of Steel project is supported by Rotherham Metropolitan Borough Council and a host of private sector companies from across the Yorkshire region. It will include an ambitious 32 metre stainless steel sculpture and an innovative Information Hub and Observation Tower to be built on a former landfill site near junction 34, M1, between Rotherham and Sheffield in South Yorkshire. Planning permission has already been granted by Rotherham Council for the sculpture and Observation Tower and a full planning application will be submitted soon for the Interpretation Hub once designs have been finalised. Preparations on site are expected to commence in the summer of 2017. Thanks to National Lottery players, development funding of £106,000 has also been awarded to help Yorkshire Icon Ltd progress their plans to apply for a full grant at a later date. The Heritage Lottery Fund grant will enable the charity to move forward with designs for the Hub and Tower, which will include an education space for schools, and an exhibition space for visitors to engage and learn about the importance of the Yorkshire steel and coal industries and the lives of people who worked in them. The Hub will become a future resource for schools and the local community, and include a café and shop. These activities will link to a panoramic viewing deck in the Observation Tower where visitors will experience the view from above and broaden their understanding of the industrial landscape through the ages. The Hub and Observation Tower will provide an immersive experience, as well as a fun place for visitors of all ages to enjoy. Heritage, education and apprenticeships will form a strong and lasting resource supported by a number of industry partners and education experts. The Yorkshire region is synonymous with steel and coal and these important commodities saw the region develop rapidly as the communities expanded during the 19th and 20th century. A number of developments in coal mining and steel production followed. Key innovations such as ‘rustless’ steel by Harry Brearley in Sheffield in 1913 (which later became known as ‘stainless steel’) is now a globally recognised material that has influenced the design of buildings and domestic products in everyday use ever since.